Thank you for your interest in one of Jacksons of Enid's online offerings. Please continue for more information regarding this 2018 Dodge Journey SE with 7,431mi. As a compact SUV, this vehicle packs all the performance of a full-size into a package that easily navigates the urban terrain. There is no reason why you shouldn't buy this Dodge Journey SE. It is incomparable for the price and quality. You've found the one you've been looking for. Your dream car. This is the one. Just what you've been looking for. 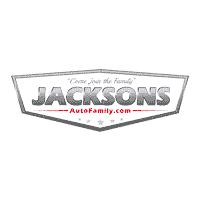 Jacksons of Enid is honored to present a wonderful example of pure vehicle design... this 2019 Jeep Cherokee Latitude Plus only has 3,050mi on it and could potentially be the vehicle of your dreams! The Jeep Cherokee is the benchmark all other SUVs strive to meet. With exceptional power, towing and handling, this SUV can handle anything thrown at it. The Jeep Cherokee Latitude Plus speaks volumes about it's driver, uncompromising individuality, passion for driving, and standards far above the ordinary. It's exceptional fuel-efficiency is a clear sign that not all vehicles are created with the same standards. You can finally stop searching... You've found the one you've been looking for. Just what you've been looking for. With quality in mind, this vehicle is the perfect addition to take home. This 2019 Ram 1500 Big Horn/Lone Star is proudly offered by Jacksons of Enid The quintessential Ram -- This Ram 1500 Big Horn/Lone Star speaks volumes about its owner, about uncompromising individuality, a passion for driving and standards far above the ordinary. Just what you've been looking for. With quality in mind, this vehicle is the perfect addition to take home. You can finally stop searching... You've found the one you've been looking for. There are many vehicles on the market but if you are looking for a vehicle that will perform as good as it looks then this Ram 1500 Big Horn/Lone Star is the one! Jacksons of Enid has a wide selection of exceptional pre-owned vehicles to choose from, including this 2019 Ram 1500 Classic. Today's luxury vehicle is not just about opulence. It's about a perfect balance of performance, comfort and attention to detail. This 2019 Ram 1500 Classic is the perfect example of the modern luxury. Do you encounter heavy snow, rain or mud when driving? No problem. With this vehicle, you've got the power of 4WD to help you overcome the toughest terrain. You've found the one you've been looking for. Your dream car. The look is unmistakably Ram, the smooth contours and cutting-edge technology of this Ram 1500 Classic Big Horn will definitely turn heads.